According to WHO, of the 38 million lives lost to NCDs in 2012, 16 million or 42% were premature and avoidable—from 14.6 million in 2000. 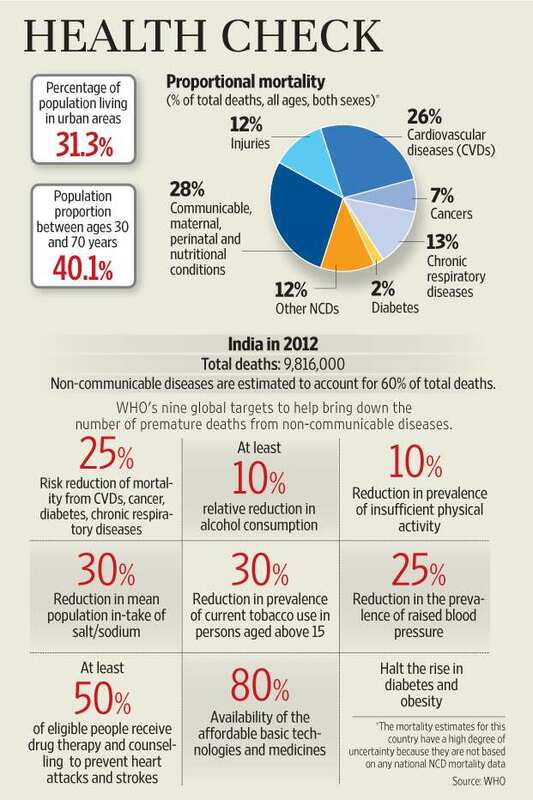 New Delhi: The World Health Organization (WHO) on Monday set nine global targets to help bring down the number of premature deaths from non-communicable diseases (NCDs) by 25% by 2025, stating that failure was unacceptable. Countries may adopt these targets in their national context and re-orient policies, WHO said in its 2014 global status report on NCDs, which include cardiovascular diseases, cancers, respiratory diseases and diabetes, which are not passed from person to person. The report offers what it calls best buy options—cost-effective and high-impact interventions—for more than 150 countries. Some interventions that are recommended include banning tobacco and alcohol advertising; replacing trans fats, which raise bad cholesterol and lower good cholesterol levels, with polyunsaturated fats, found mostly in plant-based foods that decrease heart disease risk; and promoting breast-feeding. The targets pertain to reduction in the use of alcohol, salt, tobacco, and halting the rise of diabetes and obesity, among others. “Our world possesses the knowledge and resources to achieve the nine global NCD targets by 2025," Oleg Chestnov, WHO’s assistant director-general for non-communicable diseases and mental health, said in a statement. “Falling short of the targets would be unacceptable. If we miss this opportunity to set national targets in 2015 and work towards attaining our promises in 2025, we will have failed to address one of the major challenges for development in the 21st century." The WHO report maintains that premature NCD deaths can be significantly reduced through government policies reducing tobacco use, harmful use of alcohol, unhealthy diets and physical inactivity, and delivering universal healthcare. The WHO report is a part of the implementation of the global action plan for NCDs in 2013-2020, aimed at reducing the number of premature deaths from NCDs by 25% by 2025. “The global community has the chance to change the course of the NCD epidemic," said WHO director-general Margaret Chan, who released the report in Geneva. “By investing just US$1-3 dollars per person per year, countries can dramatically reduce illness and death from NCDs. In 2015, every country needs to set national targets and implement cost-effective actions. If they do not, millions of lives will continue to be lost too soon." The report estimated $7 trillion in cumulative economic losses due to NCDs under a “business-as-usual" scenario in low- and middle-income countries in 2011-25. WHO estimates the cost of reducing the global NCD burden is $11.2 billion a year: an annual investment of $1-3 per capita. But the report calls for more action to be taken to curb the NCD epidemic, particularly in low- and middle-income countries, where deaths due to NCDs are overtaking those from infectious diseases. Almost three quarters of all NCD deaths (28 million), and 82% of the 16 million premature deaths, occur in low- and middle-income countries. The report, WHO hopes, will help countries understand the dimensions that influence NCDs outside the health sector, including public policies in agriculture, education, food production, trade, taxation and urban development.